The first time you turn on and set up your HTC One M9, you will see the Home screen with the so-called HTC Sense Home widget you can set up according to your preference. With the HTC Sense Home widget, you can get access to apps, folders, and shortcuts you frequently used based on where you are, as it is schemed to change depending on whether you’re at work, home, or somewhere else. For example, applications you use often for work will display when you’re at your office. To personalize the home screen with the HTC Sense Home widget, tap on Tap to personalize, and then tap Let’s Explore the first time you turn on the phone. To access/view widget panels for adding your favorite widgets, apps, folders, and other items, swipe left. You can also add more widget panels in case you need more room for your stuff. A limit is set when adding new widget panel to the M9 Home screen. This means if you’ve reached this limit, you can no longer add a new widget panel. Usually, the HTC BlinkFeed is always shown as the first panel unless it’s removed. You cannot add a widget panel before HTC BlinkFeed. Tap Manage home screen pages in the pop-up menu. Swipe left until you see the + (Plus) icon, and then tap it to add a new widget panel. To remove a widget panel, swipe left or right until you see the panel you want to remove, and then tap Remove to confirm action. Press the Back key when done. 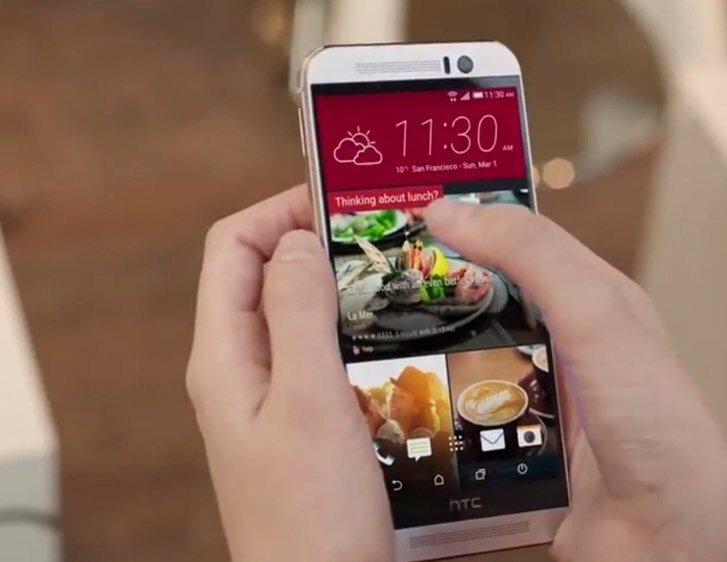 Slide two fingers together on the HTC BlinkFeed or any widget panel to customize the Home screen. Press and hold a widget panel thumbnail, and then drag it right or left to the position you desire. Press and hold the icon or widget with one finger. To rotate the screen to another widget panel, use another finger and flick left or right. Release the icon or widget. Lift your finger when you see the widget or icon turns red. To show posts from your social networks, and headlines from your favorite news media via HTC BlinkFeed, swipe right. The HTC BlinkFeed can also be customized according to your preference. To view all applications installed your device, tap the All Apps icon on the lower part of the Home screen. The HTC One M9 offers onscreen navigation buttons located at the bottom of the screen, which rotate when you change screen orientation. These buttons are categorized into two groups namely the Standard navigation buttons and the Fourth navigation buttons. Buttons for standard navigation include Back, Home, and Recent Apps. On the other hand, fourth navigation button options are comprised of hide navigation bar, turn off screen, auto rotate, notifications and quick settings. Back Key – used to go to the previous screen. Home Key – used to go to the Home screen. Recent Apps Key – used to show the thumbnails of most recently used apps, and Google Chrome tabs. Turn Off Screen – key to put the phone into sleep mode. Auto Rotate – key to turn auto rotate screen on or off. Notifications – key to display notifications list. Hide navigation bar – key to hide the navigation bar. Quick settings – key to display available Quick Settings. Adding a fourth navigation button will make it easier for you to turn the display off, toggle auto-rotate, and more functions. Here’s how to add a fourth navigation button on your M9’s Home screen. Tap to select a fourth navigation button you want to add. If you want to have only three navigation buttons, ensure none of the fourth button options are selected. To save and apply your customization, tap Done. Drag the 3-horizontal lines next to the button names. The resulting order from top to bottom in the list will be the corresponding order or arrangement from left to right on the navigation bar. Swipe your two fingers down from the Status Bar. The Quick Settings opens. Scroll to and tap an item (setting tile) to turn it on or off. To change options for a setting, touch and hold its tile or the More options icon (three-dots figure). Swipe up to switch from the Quick Settings panel to the Notifications panel. Swipe down the Notification panel to switch back to the Quick Settings panel. Swipe down from the Status bar with two fingers to open Quick Settings. Get to the Quick Settings list, touch and hold the Rearrange icon (three-horizontal bars) next to the item you want to move and then drag it to rearrange the list. Get to the Hidden items, touch and hold the Rearrange icon, and then drag it up to make it visible and accessible in the Quick Settings. Please note that the number of tiles you can display in Quick Settings is limited. To make space for another one, you have to remove an existing item. Simply drag the item you want to remove below Hidden items.